It comes as no surprise that Bohol island in the Philippines is a popular destination. Bohol tourist spots include the quirky Chocolate Hills, cute tarsiers, stunning waterfalls, the organic Bohol Bee Farm, a man made forest, and a rural interior, thus ensuring that there are always many things to do in Bohol for those looking for something other than beaches. 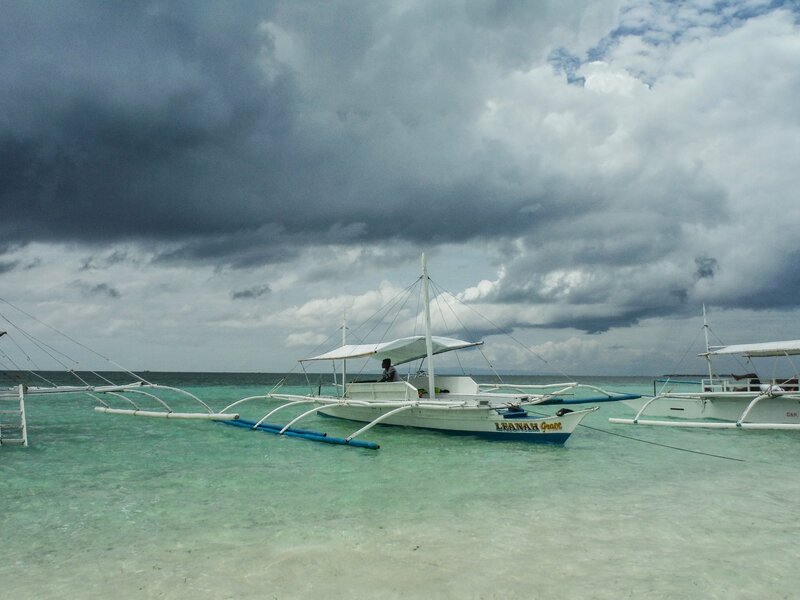 But of course, the beaches are never far off (you’re in the Philippines after all) with the popular Alona beach, one of the most well-known Bohol tourist spots, and the more local Dumaluan beach on Panglao island being only half an hour’s trike ride away. The island’s best beaches should surely be included on your itinerary in Bohol! What does chocolate have in common with some oddly-shaped hills in the interior of Bohol island in the Philippines, you may ask? The answer to that, much to Nikki’s disappointment, is … absolutely nothing! 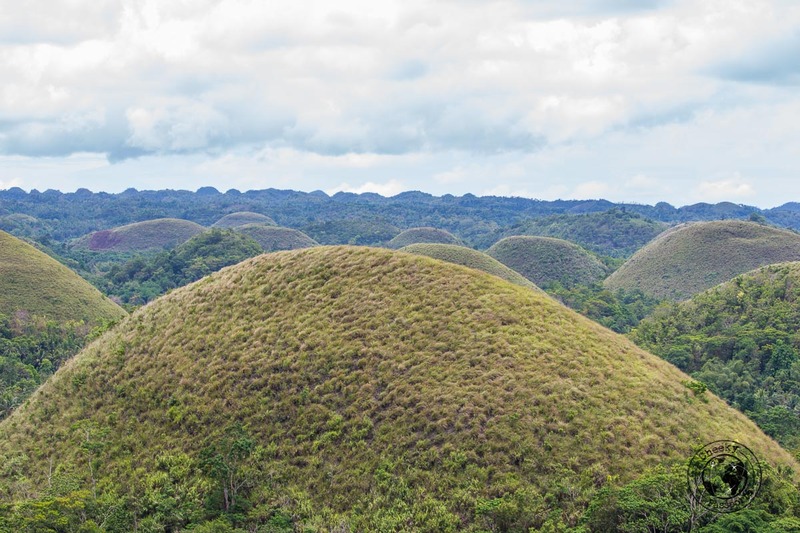 The bizarre Chocolate Hills, one of the most popular Bohol tourist spots, are so called because they turn to a chocolate-brown colour in the dry season. There are 1200 plus hills in total, the exact number is subject to dispute. Each one is between 30 – 50 metres high and they are very uniform in shape, so much so that they almost look man-made. The nature of their formation is still unclear to this day, giving rise to many legends regarding their existence. 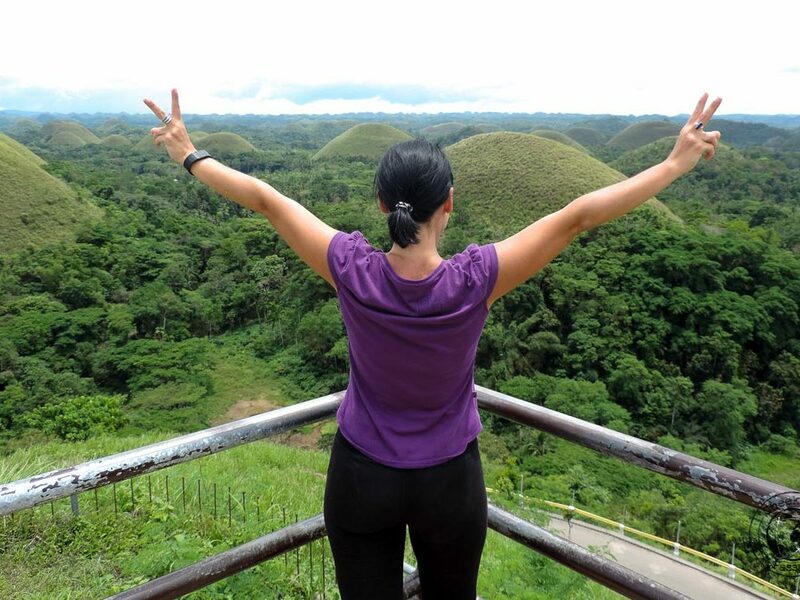 You can climb up 214 steps to the observation deck for a clear view of the hills and the beautiful surrounding countryside, making this one of the best things to do in Bohol! Costs – entrance to the Chocolate Hills area is 50 PHP (about €1) each. You can catch a local bus (direction Carmen) from Tagbilaran to get here. Alternatively, go on an organised group tour or rent a motorbike. We always promote independent travel, but if you need a little help organising a trip to the Chocolate Hills, why not check the latest tours on Viator? The Philippine tarsier is endemic to the Philippine archipelago with an established population in Bohol. Sadly, its numbers have dropped in recent years due to the disappearance of its home forests. 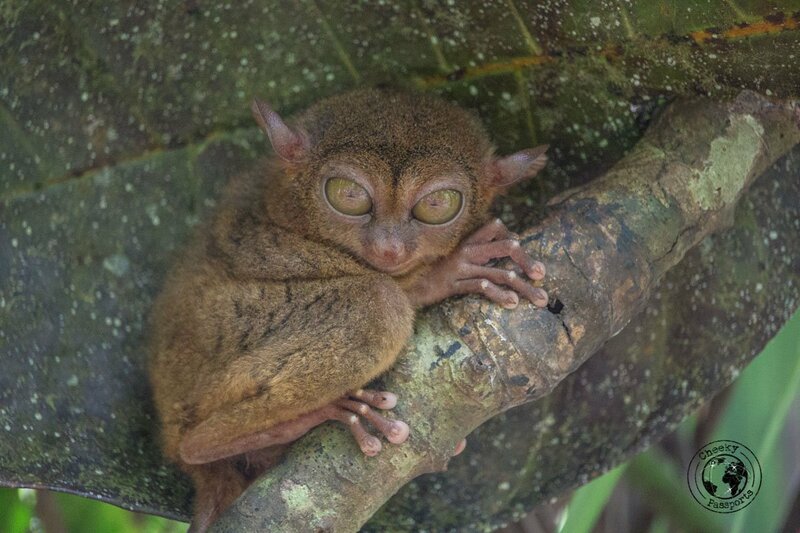 There are two places in Bohol where you can view the tarsier – the Tarsier Sanctuary in Corella and the Tarsier Conservation Area in Lobok, both of which are popular Bohol tourist spots. We really wanted to go to the sanctuary after having read reports that the conservation area was more like a zoo, however it was bad weather and the sanctuary was out of our way, so the we ended up going to the conservation centre which is situated close to the Chocolate Hills. Indeed, we came to regret this decision. We DO NOT recommend to include the Tarsier Conservation Area in your itinerary in Bohol. Tarsiers are nocturnal animals that rest by day. Although there were several signs to maintain silence in the area, crowds of loud selfie stick tourists made their way along the paths shouting every time they saw one of the little animals. To add insult to injury, many were making noises to wake up the tarsiers each time one of the animals closed its eyes. The staff did not enforce any of the written rules, letting the tourists disturb the animals as much as they wanted. We also got a feeling that the tarsiers were actually placed in position by the staff for the benefit of tourists since they all seemed to be found along the main path. Tarsiers are extremely shy and nervous animals and do not do well in captivity. They have been known to commit suicide in stressful conditions including disturbance, captivity, camera flashes, human touch etc – they do this by banging their heads against hard objects. 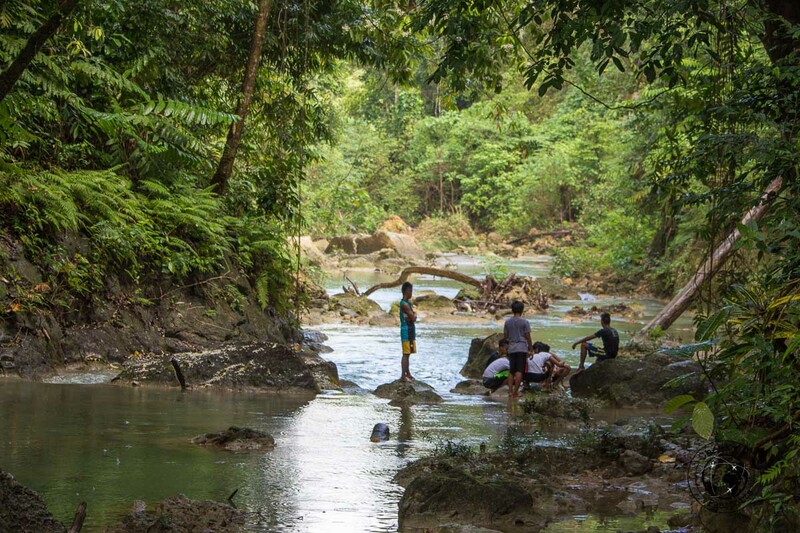 We did not realise how harmful these conditions are to the tarsier before we actually visited the Lobok Conservation Area and we now regret having supported this initiative. The Tarsier Sanctuary in Corella on the other hand, run by the Philippine Tarsier Foundation, provides a more ethical way of viewing the endangered species since this is where they live in the wild. 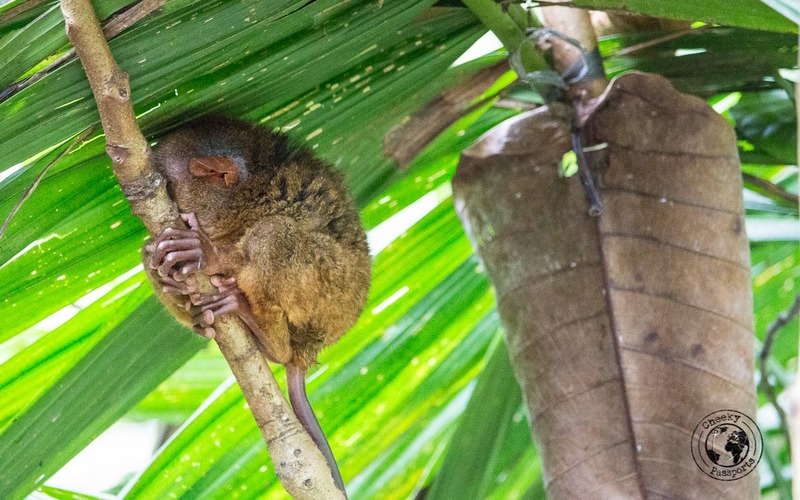 If you would like to see the tarsiers, it would be best to include the sanctuary on your list of things to do in Bohol rather than the conservation area. A couple we met the day after we visited told us that they got lost on the way to the sanctuary and after having asked some locals, were ushered into an unlicensed place where a tarsier was kept IN A CAGE. The animal was duly brought out of the cage so that they could touch and play with it at an exorbitant fee. IF YOU ARE HEADED TO BOHOL, BE AWARE OF SUCH SCAMS. DO NOT SUPPORT SUCH CRUEL AND ILLEGAL INITIATIVES! These tiny primates only grow to about 16 cm tall, making them one of the smallest primates in the world. The tarsier can turn its head around up to 180 degrees so that it can see behind it without moving its body. We will not publish our costs for visiting the Lobok tarsier Conservation Area since we do not encourage you to go there. 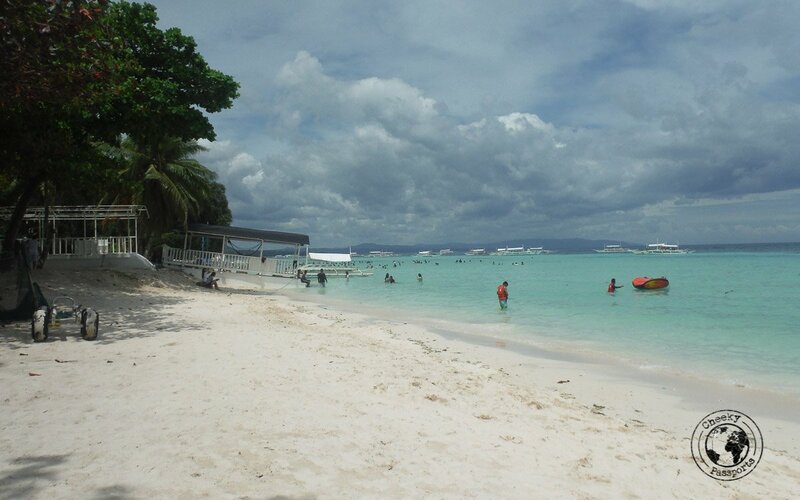 Alona beach is situated in Panglao island 30 minutes (by bike or trike) away from Bohol island across the bridge. The beach is home to a wide range of accommodation, dive shops, agencies, restaurants and sea front bars making it one of the most popular Bohol tourist spots, and the place where many people choose to spend their time while on the island. It is also the best place in Bohol or Panglao to meet other tourists and backpackers, so if you’d like to have a chat over a few drinks or a massage, be sure to include Alona beach on your itinerary in Bohol! We personally found the area to be noisy and overpriced and preferred to stay in the Dumaluan beach area which we found to be more authentic, more affordable and quieter. 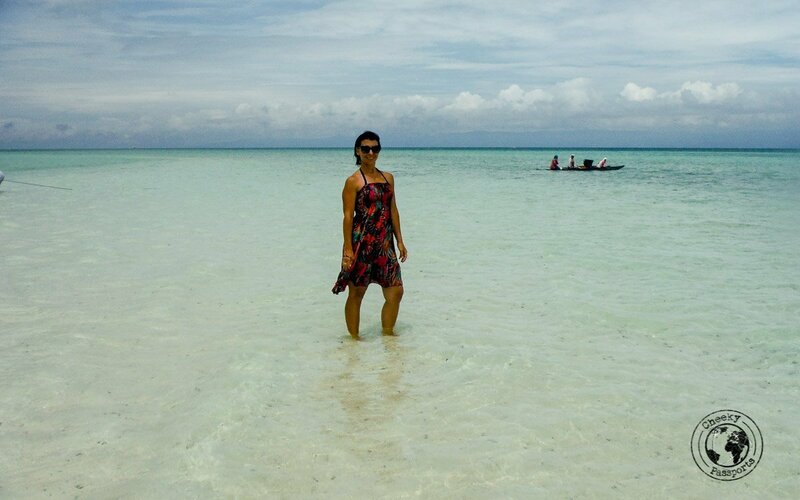 As far as beaches go, we thought that Dumaluan beach was way more beautiful than Alona too! If you’re looking for nightlife though, Alona is the place to be! Costs – Alona beach restaurants tend to be overpriced by Philippine standards. In our opinion, it is better to eat elsewhere. Drinks are just a little more expensive than in other places. There are different ways of getting around Bohol but probably the most affordable and best way of traveling around the island is by hiring a motorbike or scooter which allows you the freedom of going to places which are inaccessible when using other forms of transportation. 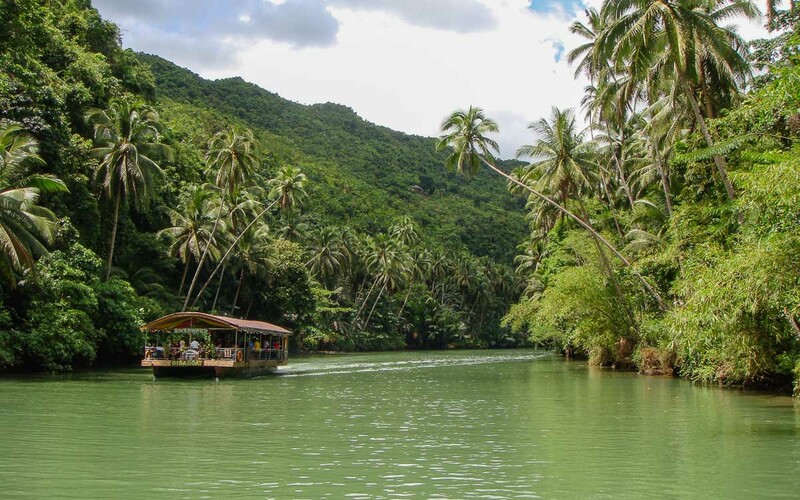 Additionally we found the Bohol landscape to be quite beautiful, so although technically this is not one of the Bohol tourist spots, we’ve included this activity among our things to do in Bohol. Many of the roads along the more rural parts of the islands are almost deserted except for the occasional bike, stray dog and friendly locals who shout and wave at you as you drive by. Traveling with a bike along the lush fertile fields flanked by banana trees and coconut trees allows you to observe the local slow-paced life giving you the feeling that you are truly in a one of kind tropical island paradise. Costs – motorbike from Panglao for 24 hours use, cost us 500 PHP (about €8), exclusive of fuel. 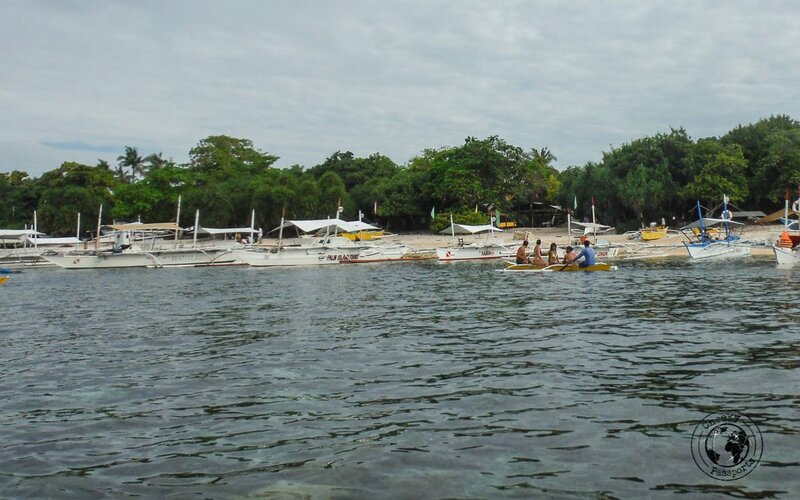 We were excited to try Panglao island hopping, hoping that the tour would be similar to those we experienced in El Nido and Coron. 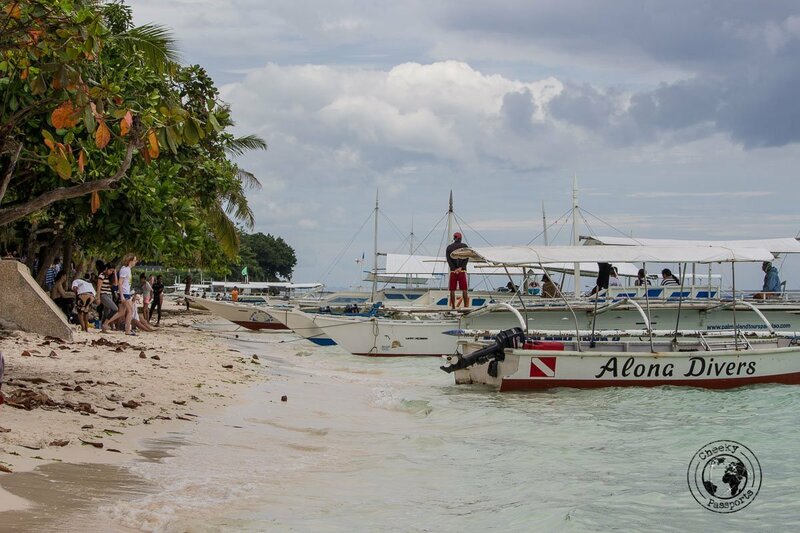 A typical early morning Panglao island hopping tour from Alona beach will take you dolphin watching, snorkeling in Balicasag island and to the Virgin Island sand bar and costs around 400 PHP (about €6.50 – this felt like a bargain at the time). Sounds like fun right? Honestly, we hated it. Here’s why. The dolphins were “not there” that morning, Balicasag island is full of tourist traps and the tour actually cost a lot more than the original 400 PHP since you need to pay an environmental fee in Balicasag, another fee for snorkeling in the marine sanctuary and yet another fee for snorkelling with turtles which we had not been informed about upon booking. The visit to the Virgin Island sand bar was the best part of the trip and we would have been happy to have found a boat man to take us to this location only, rather than joining a very disappointing and noisy boat tour. If you are interested in visiting remote islands in the Philippines, a direct ferry runs from Bohol to the nearby island of Siquijor. 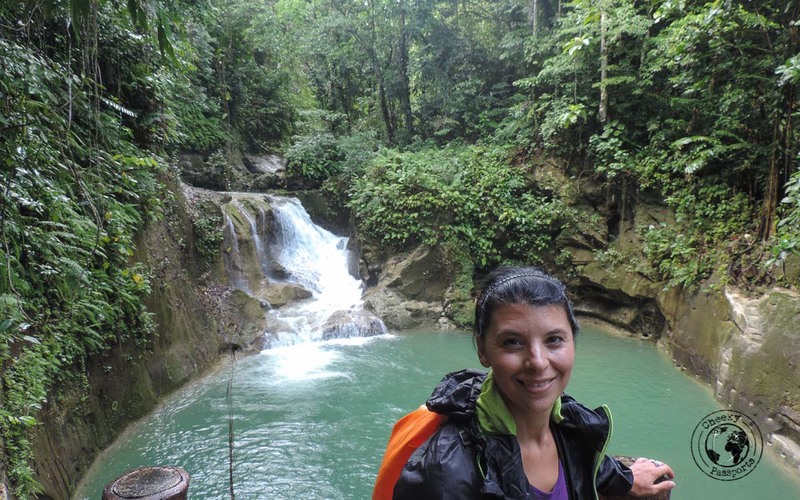 Find out about the things to do in Siquijor island here. Costs – price of original tour: 400 PHP (about €6.50) , mask and fins: 150 PHP (about €2.50) , Balicasag environmental fee: 100 PHP (about €1.50) , marine sanctuary fee: 150 PHP (about €2.50), snorkeling with turtles: 200 PHP (about €3). Alona beach is the most popular of the Bohol tourist spots, but we found it to be very overrated, and we preferred the more beautiful and less crowded Dumaluan. Dumaluan is mostly frequented by locals whilst Alona is full of tourist boats and tourists getting massages, giving it a very artificial feel. If you’re looking for pretty beaches, be sure to put Dumaluan on your itinerary in Bohol! Costs – a trike from Alona to Dumaluan is about 100 PHP (about €1.50) and your driver will very likely stop you at a resort entrance where you will be charged 250 PHP (about €4) for beach access. Ask the trike driver to take you to the “locals” entrance, which is immediately to the left of the resort and costs just 25 PHP (about €0.40). Do keep the receipt if you’re planning to return to the beach in the evening. The area around Bohol is known for being a great dive spot, with many scuba enthusiasts putting diving in Bohol on their list of things to do in the Philippines. There are five main dive areas with Balicasag being one of the most popular, not only among divers but even among snorkellers. Whilst diving in Bohol, you will come across several species of colourful fish, coral gardens and even caves, making it one of the top things to do in Bohol. Hammerhead sharks can sometimes be spotted too! Bohol also has its fair share of waterfalls, the most accessible being Mag-Aso in Antequera, about 20 minutes’ bike ride away from Tagbilaran. This waterfall does not seem to be one of the most popular Bohol tourist spots though, since there were only locals bathing in the falls when we arrived. It actually started raining very heavily, so we didn’t swim there, although this is allowed. We then came across some local kids preparing a chicken in the river. They had just killed it and were getting it ready to cook it on a makeshift BBQ. Nikki would have loved to join in and give a helping hand had it not been getting dark! Costs – an entrance fee of 20 PHP (about €0.30) is payable at the parking area. In exchange you get free use of (reasonably clean) toilets and changing room. You also need to pay an extra 15 PHP (about €0.25) if entering the parking area on a motorbike. We always promote independent travel, but if you need a little help organising a trip to the Mag Aso Falls, why not check the latest tours on Viator? If you’re looking for something different to the usual Bohol tourist spots, be sure to include lunch at the Bohol Bee Farm on your itinerary in Bohol! The organic farm doubles up as a resort but also serves rustic meals to hungry guests. The ingredients are organically grown on the Bohol Bee Farm, and you can even get a tour around the premises to get an insight into farming and bee cultivation. You can book accommodation here. Although this is one of the very popular things to do in Bohol amoung tourists, we decided to skip it since it was pouring on the day we planned to go and felt that we would not enjoy it properly. The cruise on the Lobok River (one of the Bohol tourist spots) also includes a buffet and a show by the local community. Public transport to the river is available in the form of buses and jeepneys, or you can get there by rented scooter. We always promote independent travel, but if you need a little help organising a trip to the Lobok River, why not check the latest tours on Viator? 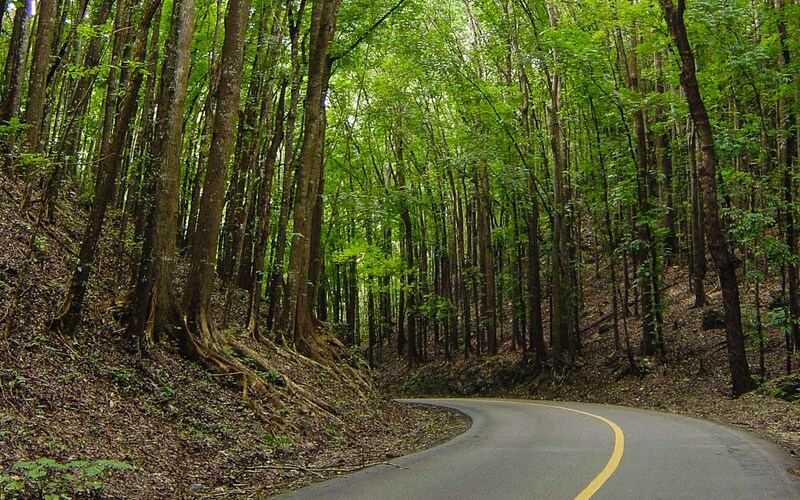 The man made forest in Bohol, located at the border of Loboc and Bilar towns, is one of the more popular Bohol tourist spots due to its instagram-worthy scenery. The large mahagony trees are uniform in size and as you’re driving through, you get the impression of going through a green tunnel. The man made forest in Bohol is located en route to the Chocolate Hills, so it’s easy to include this attraction on your itinerary in Bohol! 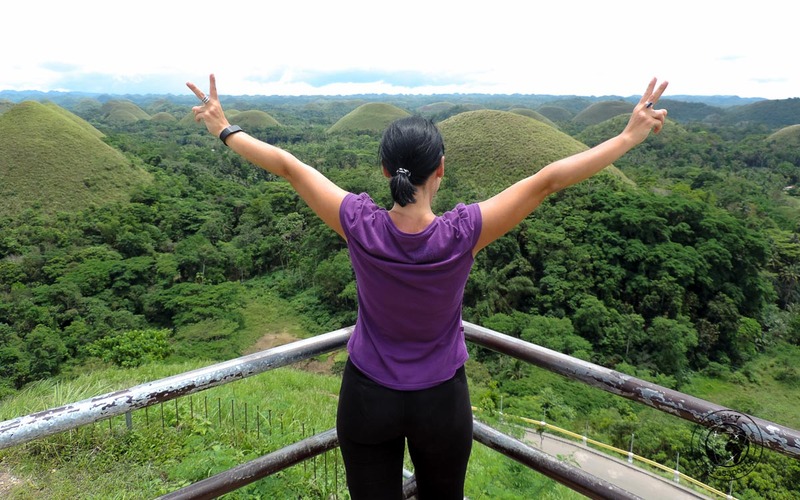 If you’re looking for fun things to do in Bohol, this is the place for you! The park offers zip-lining, ATV and rock climbing, so if you’re an adrenaline junkie, be sure to include the Danao Adventure Park on your itinerary in Bohol! Experiences include an eco-adventure tour and an extreme adventure tour among others. Costs – entrance fee of 25 PHP (about €0.40) with extra individual costs for the different experiences and activities. 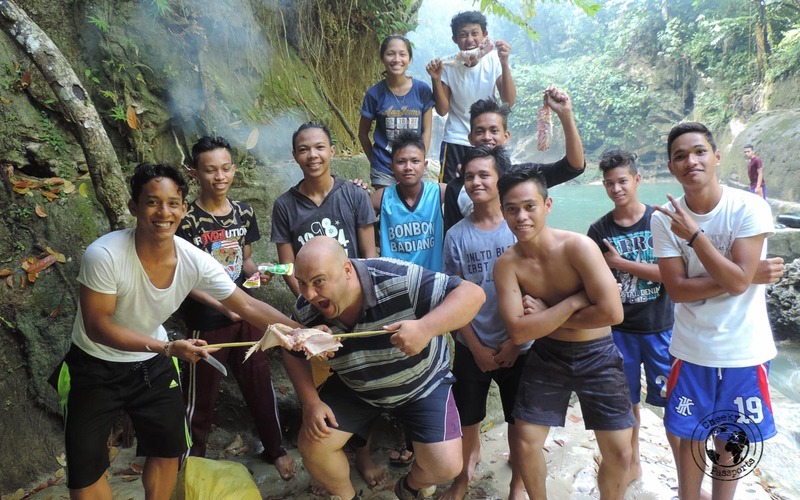 We always promote independent travel, but if you need a little help organising a trip to the Danao Adventure Park, why not check the latest tours on Viator? We flew directly from Manila to Tagbilaran airport in Bohol. We highly recommend booking your flights well in advance since they tend to be cheaper a few months before flying when compared to a few weeks before. The price of our flight had almost doubled by the time we booked. Alternatively you can fly to Cebu city and get the Cebu to Bohol ferry as detailed below. You can reach Bohol from Cebu via the Cebu to Bohol ferry. Schedule can be checked at Ocean Jet ferry. There are several daily departures. We left Bohol in this manner since Cebu was the destination following Bohol. The price of the ticket was 500 PHP (about €8). Other ferries also ply this route. We bought our ticket a few days before we had to leave but we saw several people buying the tickets on the same day. If you decide to do this, be sure to make it to the ferry terminal at least an hour before departure time! The same company also runs ferries to Bohol from Dumaguete and Siquijor. Nikki is always game for a BBQ! Where to stay in Bohol, depends a lot on your itinerary in Bohol, and whether you would like to stay close to the more popular Bohol tourist spots. We recommend staying close by the quieter Dumaluan Beach unless you like to party, in which case Alona beach would be your best bet. Check the latest accommodation deals in Bohol on Hostelworld, Booking.com or Agoda. We highly recommend Gaea’s apartments near Dumaluan beach. Our apartment on the first floor was clean and comfortable and was located close to a very pretty garden which forms part of the complex. It is conveniently located just a 15 minute walk away from the beach which is where we liked to spend our time relaxing, and also offers scooter rentals. Our favourite restaurant in Bohol was Panglao DBR Grill on Dumaluan Beach. All the dishes we tried were delicious and it was also very affordable and therefore ideal for budget travelers. It was also packed with locals so that’s always a good sign! 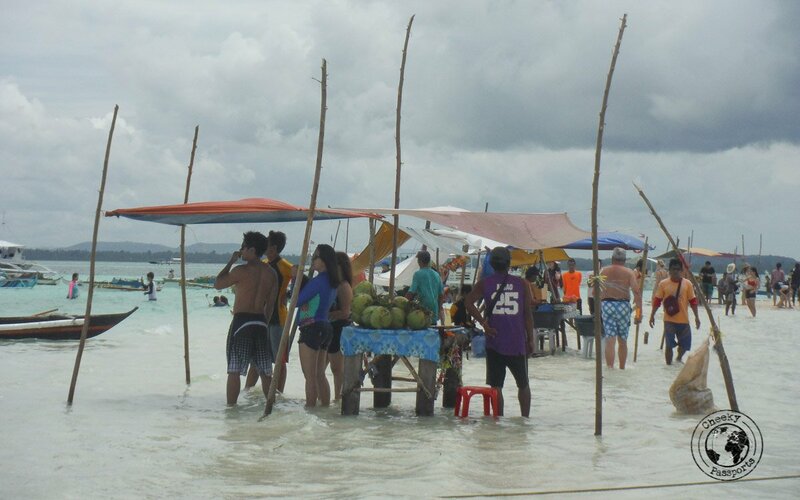 You will need to pay the 25 PHP (about €0.40) beach fee anyway, even if you are eating there. 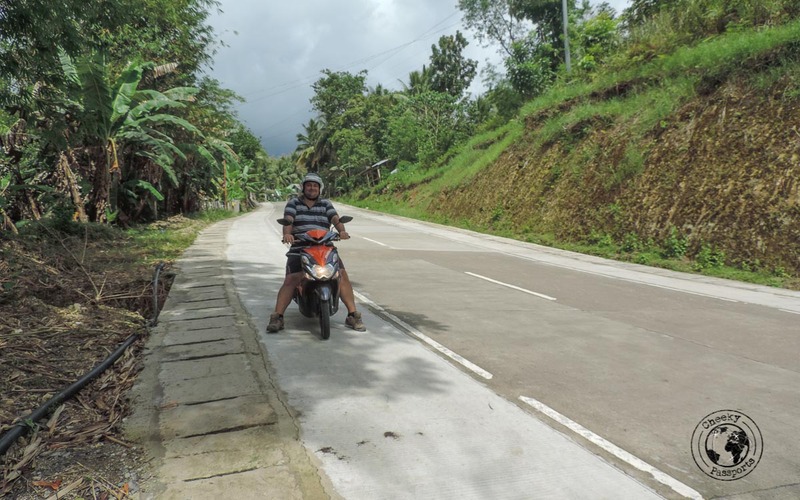 Is it easy to follow in Bohol using a motorbike? Hi Matthew, driving around in Bohol is really easy. Panglao is basically 2 main roads and a number of secondary offshoots. The areas before the junction/bridges between Panglao and Bohol may be a bit busy, otherwise there’s barely any other traffic, particularly on your way to the Chocolate hills and back. I’d still recommend using google maps or some GPS just to be sure you’re on the correct road, but otherwise signage is fine, and locals are always willing to help! Wow! So much to do here. The waterfalls sound lovely. I would love a trip to the wildlife sanctuary to see amazingly beautiful creatures. 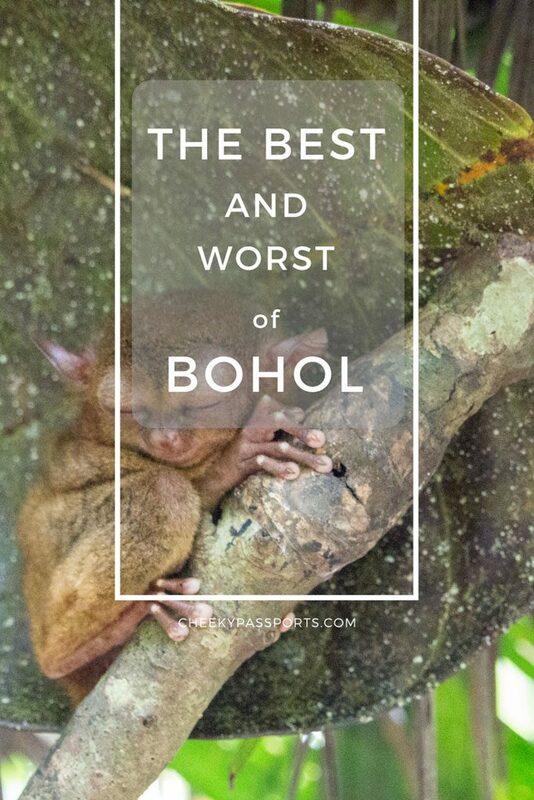 I am officially adding Bohol to my list after reading your rocking post.